Welcome to Tuesday Cuppa Tea...and we actually had some snow! Now no laughing if you live in most other parts on the US...this is a lot for our area in Sequim. When we lived in the Lassen National Forest by a mountain lake at 5,000 feet, we averaged 280 inches a year of snow...wonder why we now live at sea level and love to see the snow...up there in the Olympic Mountains of Olympic National Park! 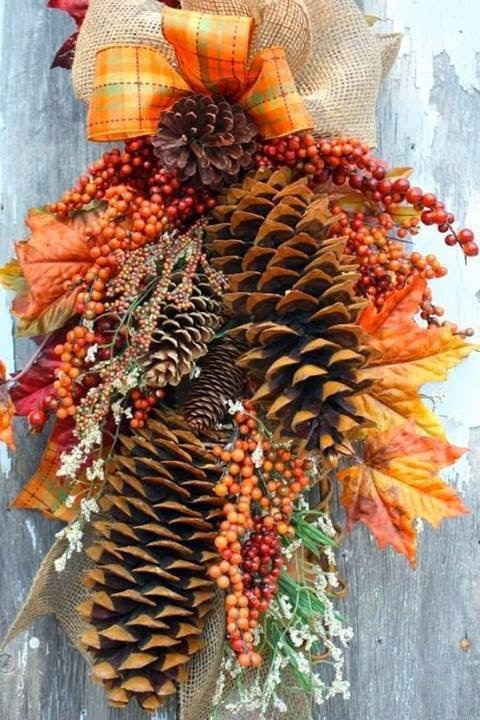 With that in mind, and finding this door swag on Pinterest with the foot plus long Sugar Pine cones we had in the forest...still have one I can't part with...I decided to share a pinecone teacup today for Tuesday Cuppa Tea. 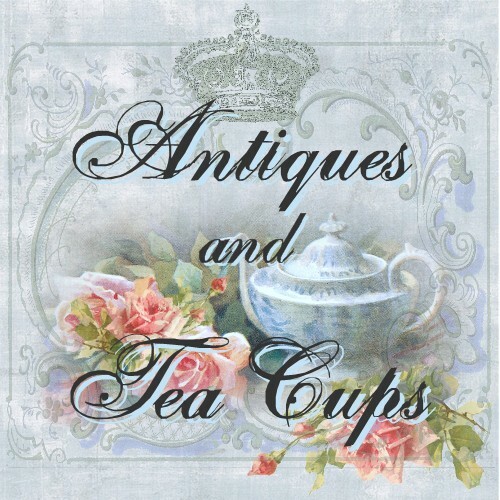 This is a 1950s English bone china teacup and saucer made by the Clarence China, England company. You don't see too many pinecone cups and saucers...as you know flowers abound. That's why I like this one...a bit unusual! 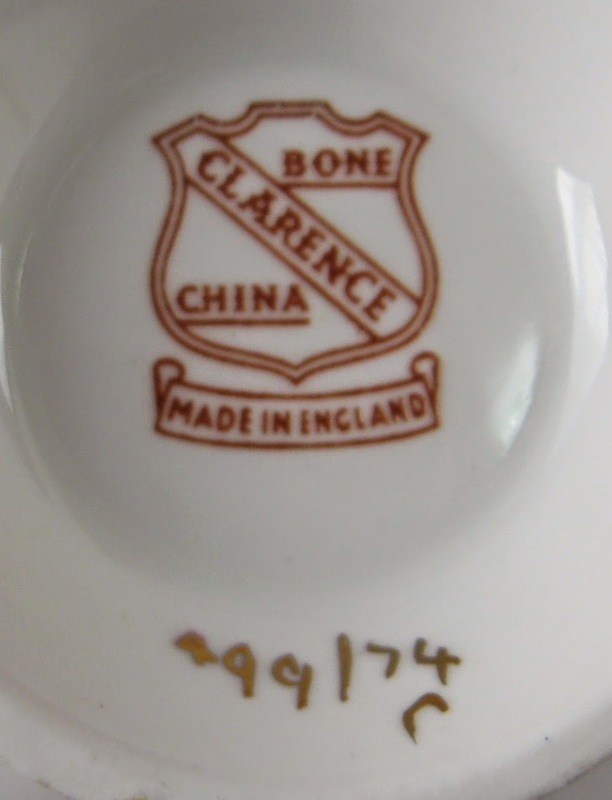 Clarence was part of a co-operative potter's wholesale group of maker's that worked out of the Crown Clarence Pottery in Longton, Staffordshire. The group used variations on that name and Windsor from the time they began in 1946 in the post World War II period until they closed in the mid 1960s when so many potteries closed their doors. Very fun design for this time of the year. 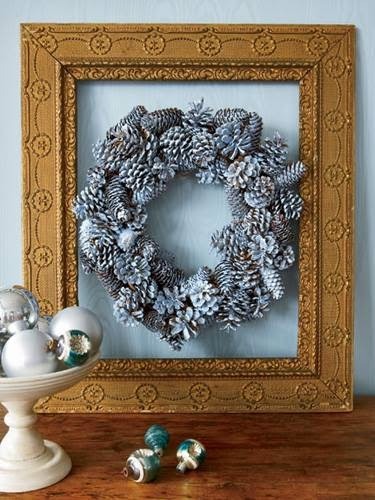 This pinecone wreath came from Country Living magazine. I know some of you love green tea, but I find it bitter and unpalatable. A friend who is a geneticist and researcher, says that's because basically people have either the genetic makeup for sweet or savory, and I am a sweet person genetically. My husband is the opposite. Anyway, it is recommended that he has green tea for it's antioxident properties for his Parkinson's Disease and I wanted to join hi,. 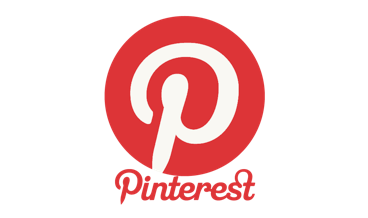 I tried lots of varieties, loose and bagged from various companies, and have found 2 I like. Stash Tea's Green Chai tea and Bigelow Tea's version of Constant Comment using green instead of black teas. I don't mind either of those! Have you tried them? I have to mail order them as they aren't readily available in the stores around here. I found this great recipe on the blog Oneshetwoshe that I wanted to share...It looks delicious, easy and a small portion which is good! I hope you all had a marvelous Thanksgiving. 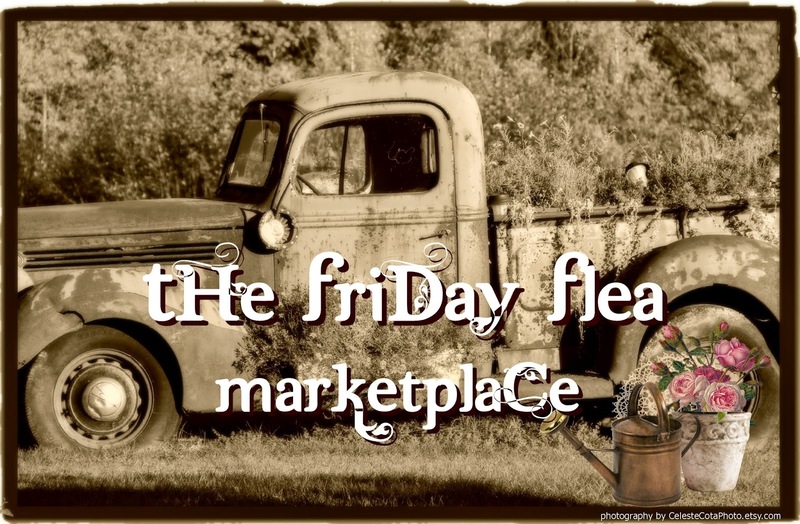 We went out to our local Nash's Organic Farm store yesterday for veggies...love their local organic apples, brussel sprouts, cabbage and other goodies. Sprouts tonight with leftover turkey! Thanks for joining me here for Tuesday Cuppa Tea. 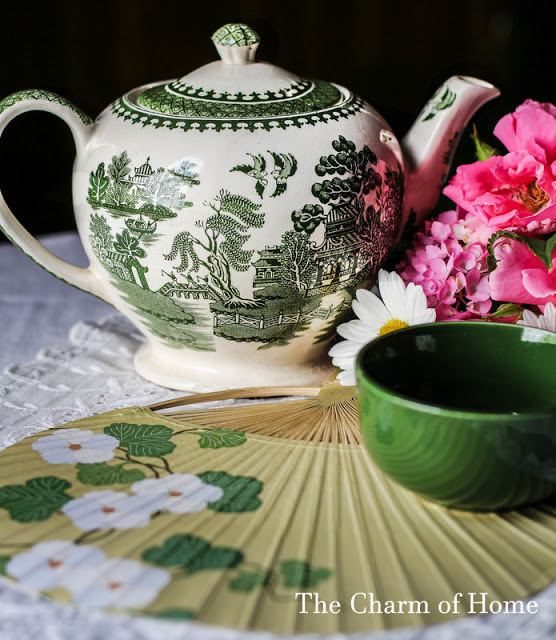 The list is below of some of the other blog parties I am joining and the Linky for your tea, teacup, tea room or tea party link. 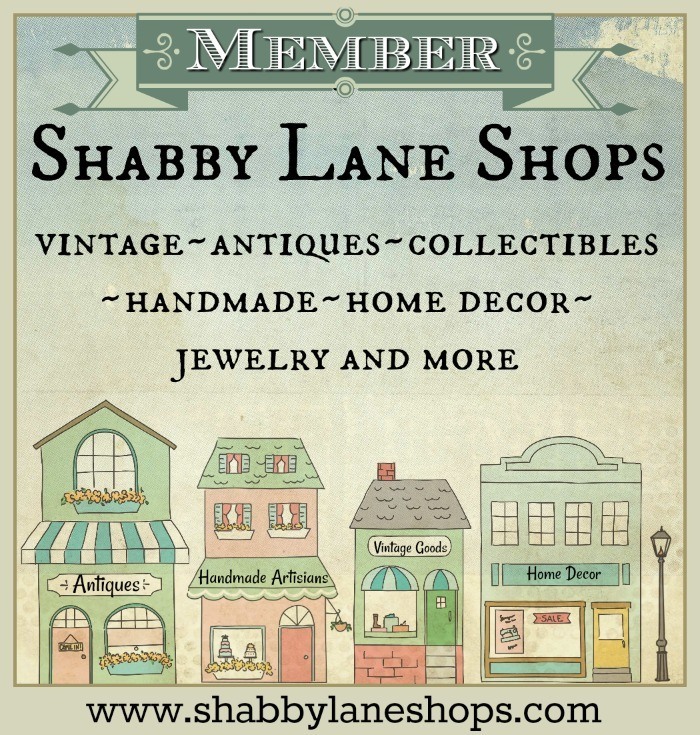 Just a reminder that my websites, Antiques And Teacups and Antiques And Teacups at Etsy are having our 15% off sale! Ruth what a delightful cup! I like seasonal cups that can stay out longer than the holidays, and your pinecones are perfect to display all autumn and winter long. Your snow story is funny. This stuff is easier when we are younger. We have folks we check on when the weather gets extreme. Thanks again for the info about the potteries. You should write a book! I love your pine cone teacup! I don't see many of them around here so it's a treat to see yours. I have a box of Stash Green Chai tea in my cupboard right now and I am fussy about my green teas. I don't really care for the plain. 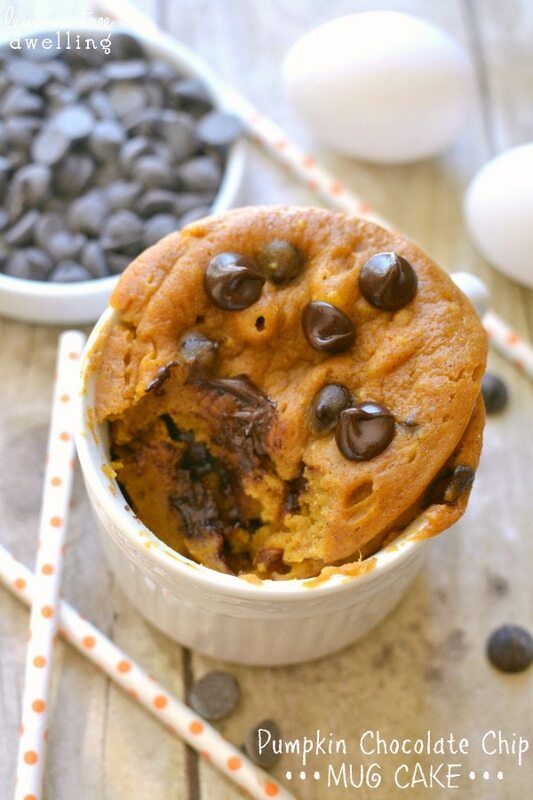 The pumpkin mug cake looks wonderful! Thank you for hosting, my friend, and enjoy your day. I do love that pinecone tea cup. Another one I shall have to see if I can find. I tried drinking plain green tea because of the health benefits, but it just didn't taste good to me. I like the sweet stuff too! Then I saw that Lipton's had some flavored green teas and some were decaf too (like I'm supposed to do). I tried the Blackberry Pomegranate decaf and it's really good. Can't wait to try the mug cake. It sounds yummy! Hi Ruth, I like your pinecone teacup, and the wreath is very pretty. I'm not big on green tea either. I like black best. I do like Celestial Seasonings Candy Cane Lane. 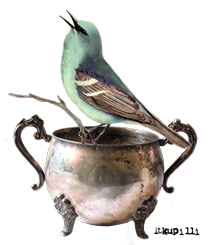 Your pine cone teacup is a beauty! I would use that pretty one all winter long. The recipe you shared sounds so yummy. I could use up the bits of leftover pumpkin I have in the freezer. Thanks for hosting your party! I have pinecone decor out for winter and your teacup would be perfect to sip from right through until April. I'd love to see the snow photos if you can find them. We're only a couple of hours drive north from Buffalo and we didn't get anywhere near the snow they did. 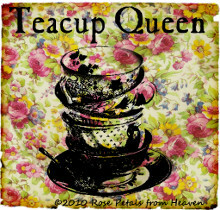 I like jasmine tea but not plain green, my favourite is a good black tea, often flavoured. 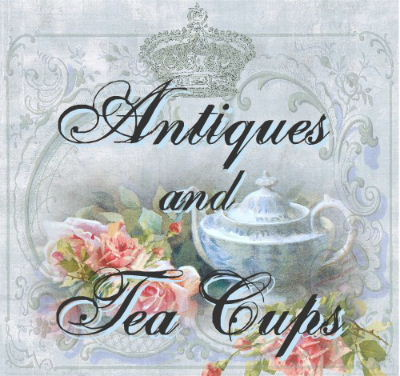 Ruth, I love that pine cone teacup! I also am drooling over that mug cake. It looks delicious. Thanks for hosting! The pine cone teacup is lovely, and would be perfect at my house where the menfolk prefer something a little more masculine. I think I must be genetically sweet :) haha. I really prefer plain black tea, sometimes with milk and sugar. That recipe looks yummy! Hi Ruth! 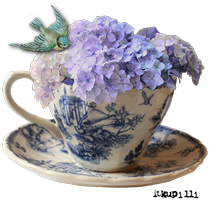 Your teacup this week is very pretty and a perfect one for the start of the Christmas season. I can't imagine as much snow as you described! We get some where I live, but Virginia is still southern, so two feet is a lot for us. 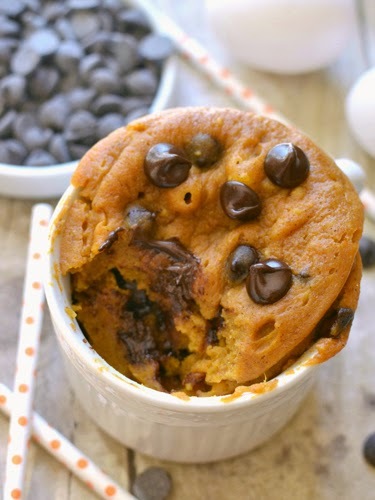 The mug cake looks delicious, thanks for sharing the recipe. 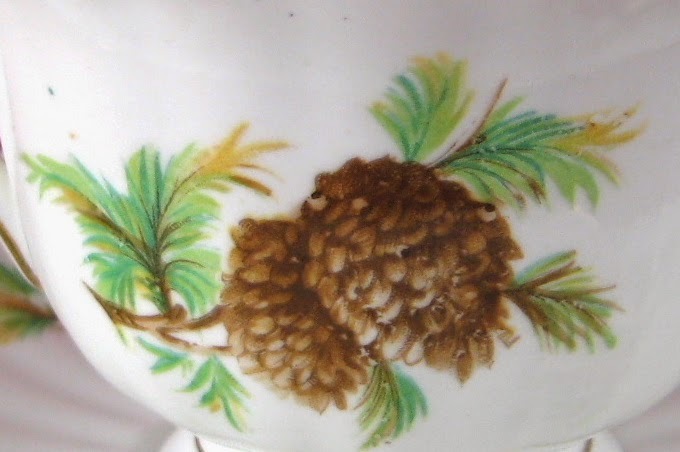 Oh, wow, I love your tea cup with that pinecone design. As much as I love snow, I can't imagine having six feet of it in one night! We've only had snow once this year and it was three inches. The mug cake looks delicious. 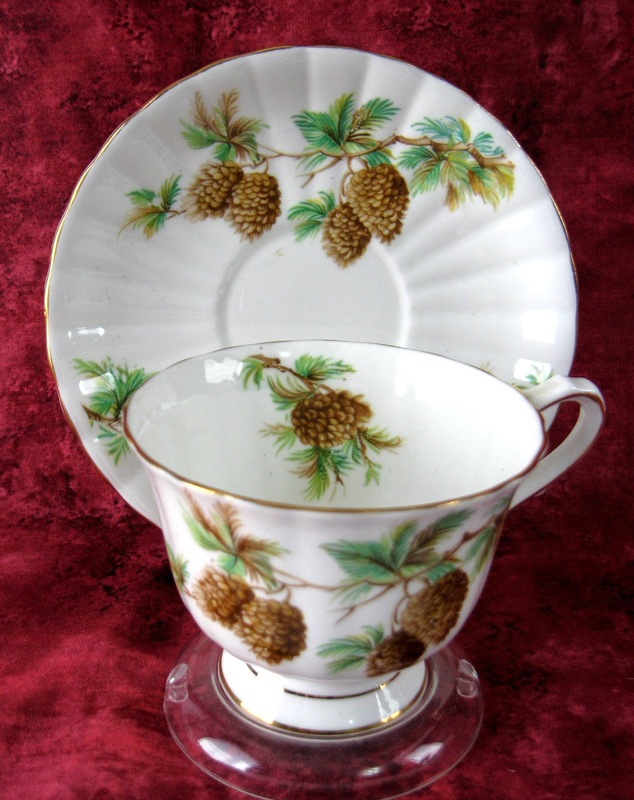 Love your pinecone cup and saucer just perfect for the season. Love the wreath and swag too! I like to make bird feeders out of them by rolling in peanut butter and seeds and hanging them with ribbon from my trees (bird/squirrel holiday gift!). Your pinecone design cup and saucer is so pretty! That definitely strikes a chord with me, as pine trees are everywhere here in Georgia. And I did not know that Constant Comment came in a *green* variety. Thanks for the heads-up! That is really a beautiful cup and saucer. It would even be nice for a man! Love your snow you got. We had our air conditioning back on today but tonight it is cold again. Thank you for sharing at Friends Sharing Tea. I think your snow looks great. It's getting colder again, and it snowed an itty bit today but all that gorgeous snow we had is gone. Hopefully it will come back soon because I love winter and absolutely love snow. Your pinecone teacup is AWESOME! I used to have one but I sold it. Sure wish I hadn't. I just was working the finishing touches on a pine cone post, but wanted to visit the tea friends first, as yesterday I wasn't able to finish and catch up. 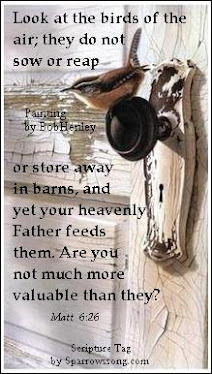 Thanks for hosting, sorry I am late with my joining the linky party. My best to you. That cup and saucer is so exquisite! i haven't had Constant Comment in ages! !